The night has lifted and Sara Fairchild is out for blood. But this time, it’s her own. 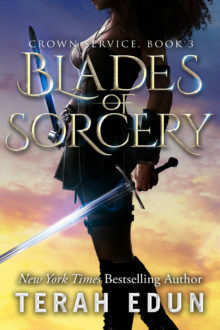 A gifted fighter and a skilled battle mage, Sara is now fighting everything she stands for — her heritage. For too long, she has held onto the certainty that her father was an honorable man. But what does honor mean when you’re at war and surrounded by corruption from all sides? As Sara Fairchild brings the Kades to their knees and manages to capture a prize that rivals Nissa Sardonien’s worth to imperial intelligence, she has to wonder — how far should she go to extract the secrets her Empress and her empire needs? As she fights to outmaneuver her growing list of enemies and win a war that becomes more complicated by the day, Sara Fairchild knows that no matter what, the empire will never be the same.